Jenny Johnson: Biola's Back In Town! The same day that the CCC team left, the Biola team arrived! That was a fast flip of our house! This group of students/musicians brought young energy with beautiful music! I went out to youth group at Peris with them one evening and some of the girls sang and played the guitar! The kids absolutely loved it! They were here for Children's Day so we planned a carnival for all the kids in Rosiori. The kids especially loved it when they played the Romanian National Anthem. Sadly, I don't have any pictures of that day!! 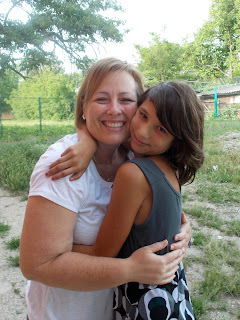 I am a missionary in Romania. I work with orphan kids. I love frogs, scrapbooking, and the color pink. I love my family, especially, my adorable nieces and nephews!! End of the School Year!